Choosing the best Canon lenses for video can be tricky. Some of it depends on your camera. For example, the best prime lens for Canon 70d is going to be different than the best lenses for Canon 5d mark iii video. But don’t worry. We did the research to try to help you sort through all the technicalities so you can find the right lens for you. Before we get to the reviews, here are some key features to keep in mind. Zoom Type: Our top picks offer a few different types of zoom. As you go through our list, you’ll see vari-focal, motorized, and digital zooms. There are quite a few lenses that are fixed and don’t have any zoom at all! Size: Some of these items are kits so if you see 2 sizes listed, the kit contains one of each. 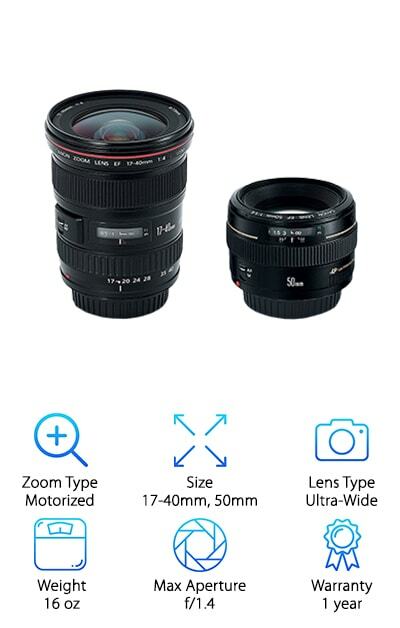 Generally, these lenses cover a wide range of sizes. We included lenses from 10-18mm all the way to 300 mm. Lens Type:There are so many types of lenses available and we wanted to give you some options. So, we included a variety: zoom lenses, prime lenses, telephoto lenses, wide-angle lenses, and standard zoom lenses. Weight: There are 2 things to consider when it comes to the weight of a lens. Is it light enough that you’ll be comfortable shooting video with it on your camera? And, how easy will it be to transport? Max Aperture: Simply, aperture is the hole in the lens where light enters the camera. The larger the number, the smaller the hole, the opposite of what you would think. The faster light can come in, the faster the lens is. Warranty: Warranties are always important, but for a camera lens, it’s a good idea to pay close attention. Know what’s covered and what isn’t. Because these are all Canon lens, the warranties are basically the same and last for 1 year. Now that you know a little more about the features of these lenses, let’s get into our Canon video lens review. If you’re short on time, make sure you check out our top pick and budget pick first. We made it super easy for you by putting them both right at the top of our list. Keep reading if you can because the rest of our list is pretty great, too. All right, let's get on with our reviews! Our pick for best Canon lens for filming is actually a set. This Portrait and Travel kit comes with 2 lenses, one meant for portraits and one for every day. The first lens is 50mm and has a fixed focal length. This one is ideal for everyday photos and is even good in low-light. 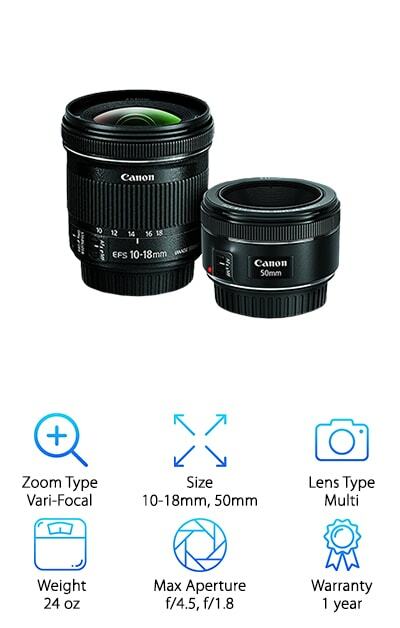 The second lens is a 10-18mm ultra-wide zoom lens and the best zoom lens for Canon 70d. One thing that makes this set great for video is the auto focus. It’s on continuously when you’re recording video. Not only that, it’s quiet, too, so you won’t pick up much interference on your recording. It’s easy to see that this kit is a great investment. Not only is this Canon EF STM lens our budget pick, it’s also our pick for the best lens for Canon 6d camera. This lens is made for portraits, action, and even night-time video and photography. It’d be great with any camera but works particularly well the full frame of the 6d. One thing that makes this Canon lens for video so effective is the autofocus. It runs continuously when recording and, again, works really well with full frame cameras. The autofocus is also really quiet, too, so it won’t interrupt your shot or be a distraction during playback. The maximum aperture makes this the best Canon lens for low light video and we love the way it produces a background blur when filming things up close. Not only does this kit have our pick for best prime lens for video, it also has the best zoom lens for video. This advanced set includes an ultra-wide zoom lens and a standard prime lens. With the lenses in this kit, you can easily go from filming your children playing on the beach at sunset to capturing the moment when the sun goes below the horizon by quickly switching between these 2 lenses. They also focus very quickly so you won’t lose any precious time. Here’s something great: these lenses are weatherproof. Don’t worry about a little bit of wind, rain, or snow. When using either lens, autofocus helps keep things steady and manual focus is always there for you to use if you need to. This is the best lens for Canon 70d that we found in our research. This is an ultra-wide zoom lens that captures high-contrast, high-resolution images with little or no interference or glare. 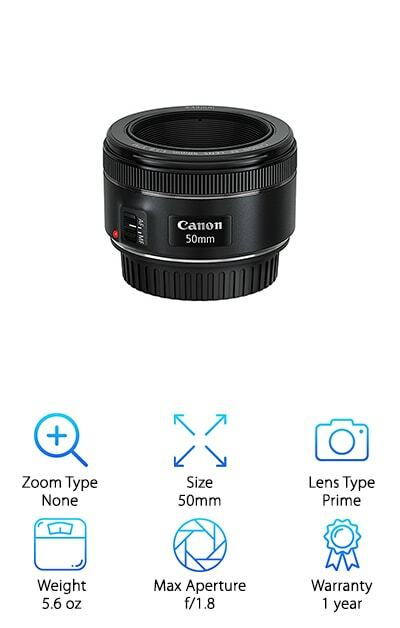 You can get a nice background blur with this lens that will make your videos and photos look like those of a professional. Another reason we think this is the best video lens for Canon 70d is because of how stable it is. The image stabilizer system corrects shaking in 4 directions. Plus, there’s also a refined focus mechanism that gives you continuous autofocus while recording video. The autofocus is quiet, too, so your recordings are free of any distracting noises. That said, if you want it, manual focus is always there and ready to go. This Canon EF-S SLR lens is our pick for best lens for video Canon 60d, but it’s definitely not your ordinary lens. What do we mean by that? Well, this is a macro lens. It gets super close-ups that can show details that even your own eyes can’t pick up. Macro lenses usually are used to give close attention to things you normally would think twice about because you see them in a different way. 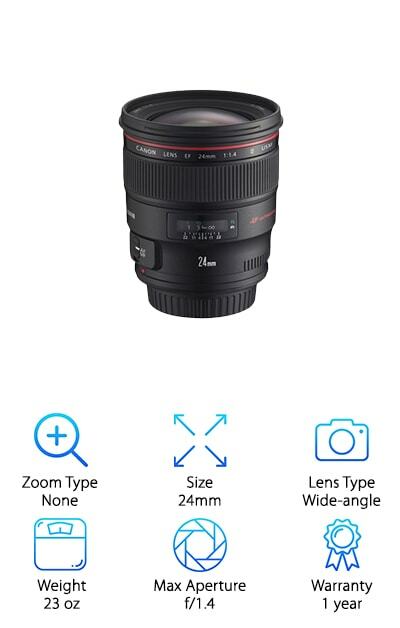 This lens isn’t going to record a typical video. 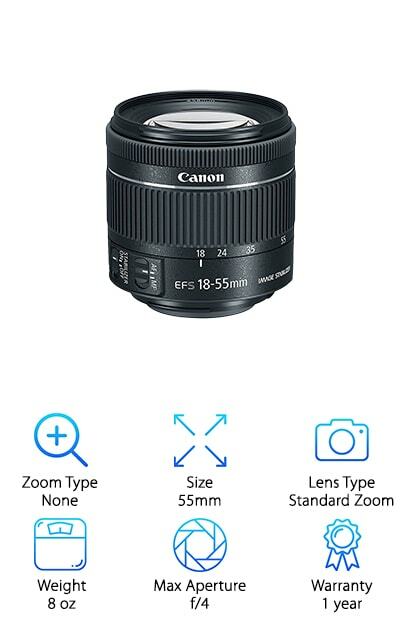 But if you want to create cool, close up videos of things like insects, flowers, or individual snowflakes, this lens will help you create some awesome looking videos. 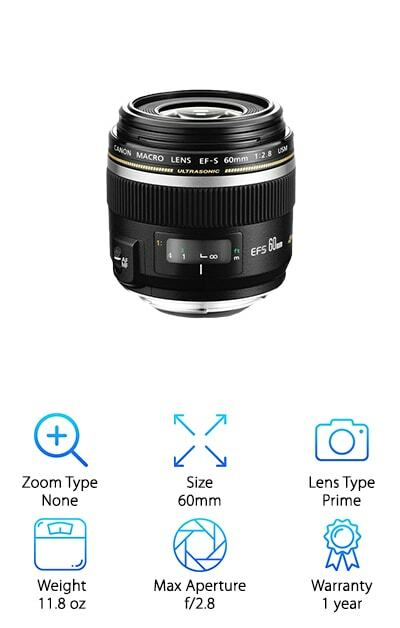 If you want to also use it to take photos, this lens is good for some interesting portraits. Hands down, this is the best telephoto lens for Canon 70d. And, if you want to get some awesome and interesting videos, it’s best lens for Canon 70d video shooting, too. 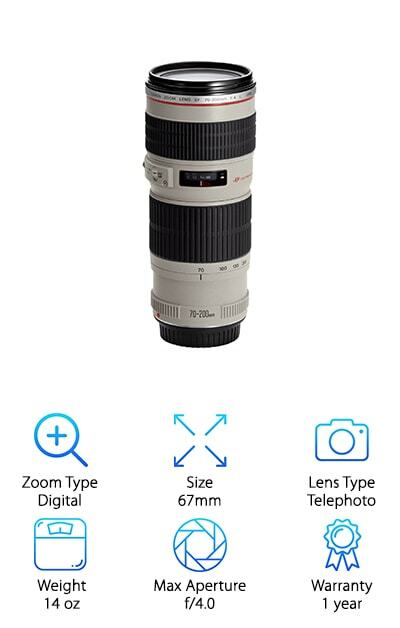 With this lens, you’ll have no problem getting video of the action on the football field, close-ups of animals at the zoo, or capturing footage of birds in far-off trees. This lens has an inner focusing system and ultrasonic monitor. What does that mean for you? Quick and quiet autofocusing so you won’t miss out on any action. One thing unique about this lens is you can add a polarizing filter to give your images a little extra warmth. Because the lens doesn’t rotate when it focuses, simply attach the filter to the front of the lens. 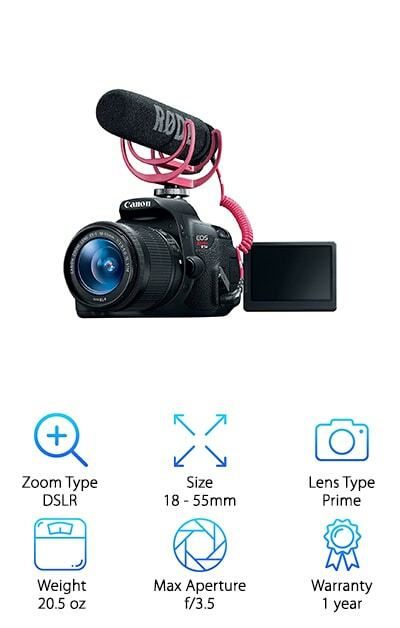 If you’re looking for more than a lens to help you make amazing videos, here’s a kit that gives you an awesome camera, too. The EOS Rebel T6i camera to be exact. This camera is easy to use and works well in a lot of lighting situations. At the push of a button, you’ll be making Full HD videos. Working together, the camera and lens focus quickly. The autofocus is designed to keep your videos clear even when you’re moving fast to get your shot. Plus, there’s an automatic wind elimination feature so your audio doesn’t get drowned out when you’re shooting outside. If you want to start making videos and are looking for a camera as well as an awesome lens, this is the way to go. 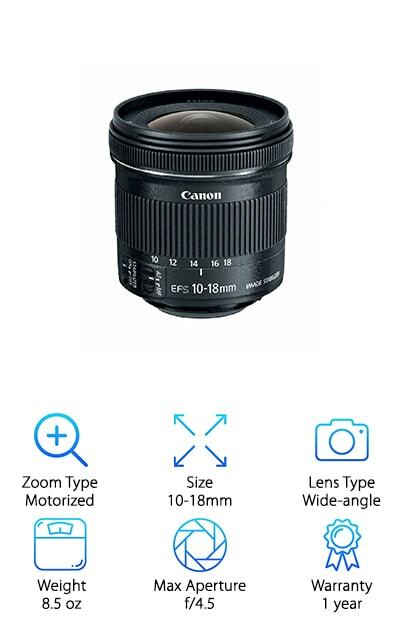 This is a great wide-angle lens that comes in a nice little bundle is a good Canon lens for video. It includes a lens cap, filter kit, and cleaning kit. The lens itself is slim and very lightweight. wide-angle lenses give some really cool looking effects so shooting video with this one is going to produce some really cool results. One thing we really liked about this best wide-angle lens for Canon 70d was that when video recording, the autofocus stays on continuously but stays quiet so it doesn’t show up on the recording. So, you get stable, clear video without any distracting noise. We consider this a best low light lens for Canon, too, because the images it captures are sharp and clear. It also focuses really fast and gives some cool background bokeh effects. This wide-angle lens is our pick for best lens for DSLR filmmaking because it’s great at getting sharp, clear images in almost any situation. Even though this is a wide-angle lens, we still think it’s the best DSLR lens for video Canon. Why? For one thing, it’s great in low-light. Plus, because it films from a wider perspective, it creates a cool background blur effect that adds a different level to your video and photographs. 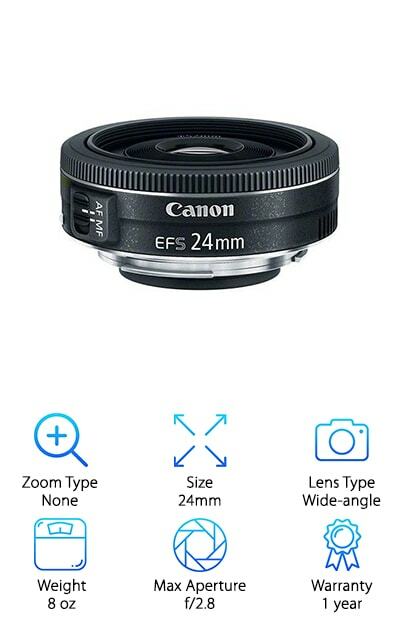 This lens also has Canon’s Ultrasonic Motor for fast and effective auto-focusing with manual override always readily available. There’s also a great anti-reflective coating on the lens that minimizes any flare, no matter what angle the lens is. This truly is the best Canon DSLR lens for video. We’re calling this one the best all purpose lens for Canon t5i for a lot of reasons. For one thing, it’s compact and lightweight so it’s easy to take with you when you’re on the go. Think about it: you can easily take this one along just about anywhere so you’ll always be ready to capture those unforgettable moments as they happen. Another thing that makes this the best lens for Canon t5i is the autofocus. It’s smooth and really quiet so you don’t have to worry about anything interfering with getting a great video. This is a nice bundle that includes a lens hood, 3-piece filter kit, lens pouch, and cap keeper to help you take it along on your adventures and keep everything together and protected.